The Genetics Kits are tools for the Creatures series of games. They are all now freely available for download (see External links). They enable you to edit the genetics of all your Creatures, and lay eggs with these new genetics. They are "the most advanced tools for Creatures today!" This was a tool originally sold by Cyberlife. It was released in December 1997 (see history), and over 1,000 copies were sold in the first three months of its availability. There was a Preview Kit available for free. The export tab, in addition to allowing the player to lay eggs from a genome into the game, allows the player to inject C1 CAOS Codes ("macros") and to save a list of useful macros that they can then call on at whim while playing. This genetics kit is compatible with both Creatures 3 and Docking Station. 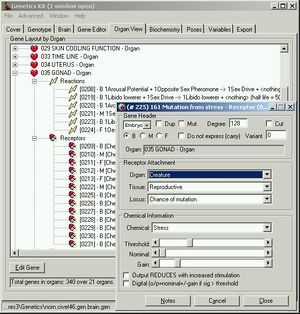 Getting Started with the Genetics Kit is a series of tutorials by Lis Morris for Creatures 3 gengineering with the Genetics Kit, covering a variety of modifications. This page was last modified on 6 February 2019, at 00:18.